Sidney Jones' preseason debut was largely uneventful, which turned out to be a good thing. There was nothing terribly notable about Sidney Jones' performance in his first Eagles preseason game, and that turned out to be a good thing. Jones played about a quarter-and-a-half on Thursday, as nickel cornerback for the first- and second-team defenses. Not much action came his way. He made the tackle on the game's opening kickoff, dropping returner Quadree Henderson at the Steelers' 16. Later, Jones ran afoul of the NFL's new helmet-hit rule, when he helped Rasul Douglas bring down Damoune Patterson. The third-down penalty on a completion short of the sticks kept alive a Pittsburgh touchdown drive in the Steelers' 31-14 victory. The only long completion the Steelers managed when Jones was playing went to the other side of the field; Douglas stumbled trying to time his leap, and JuJu Smith-Schuster easily caught the ball, then ran for a 71-yard touchdown. A while later, the cameras were on Jones, and not in a good way. He was helping on a tackle when Eagles linebacker Nate Gerry flew in and upended Jones, seeming to catch Jones' left foot. Jones landed hard on the Lincoln Financial Field turf and stayed down, holding his foot. It was the Achilles tendon in that foot that Jones tore on his University of Washington pro day, causing him to drop to the second round of the 2017 NFL draft, where the Eagles took him with the idea they could wait a year to see him at full strength. Jones, whose only rookie action was the meaningless Dallas game at the end of the regular season, has been everything he was advertised to be in this training camp — smart, fast, aggressive, smooth. 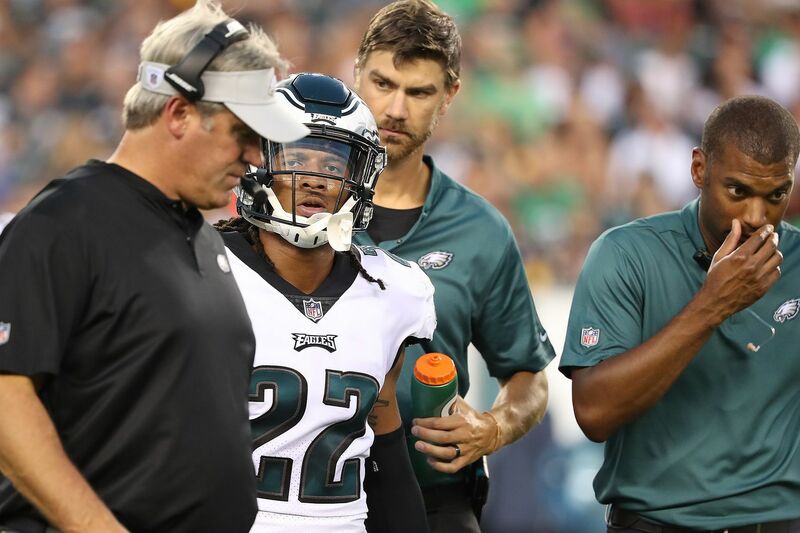 He didn't really get to show much of that Thursday night, and then he was limping off, heading to the examination table behind the Eagles' bench, taking off his left cleat and waiting as new Eagles orthopedic surgeon Christopher Dodson prodded his foot. Eventually, Dodson had Jones stand up and hop around on his left foot. Then, Jones laced up the cleat and got his ankle retaped. Jones didn't come back into the game, but he remained on the sideline, helmet in hand, apparently available. An injury in the preseason opener, after Jones missed the last three weeks of spring work with mysterious "lower body soreness" might trigger questions about durability. Jones said afterward he'd suffered a low-ankle sprain. There was no visible swelling. "I thought, 'ankle sprain, damn,' " he said. "So I got up and walked it off. Just an ankle sprain." "I know I scared everybody," he said. "After the game, I texted my people. I'm good." It was interesting that Jones played exclusively in the slot. That is where he mostly has been in camp practices, but defensive coordinator Jim Schwartz warned against reading too much into that. Guys will be moved around. Ronald Darby and Jalen Mills are doing really well on the outside; they were fine in their two series of work Thursday. Jones as the nickel, where Patrick Robinson excelled last season, just might be the plan. Jones had never played slot at any level before this spring. But he has been willing and confident, a sure tackler despite his 6-foot, 181-pound frame. "Most of the game, I was a zone-dropper, and I was in my run fit," Jones said. "Had a couple of good tackles, here and there." Jones said he did not know whether he's in the slot for good. He said he felt OK in that role coming out of the spring, but has gotten more comfortable. "From the beginning of camp to now is a big difference," he said. Jones said he did not have "more clarity" on the helmet rule. "What clarity? That was a regular football play. That's the way I've played all my life," he said. "That's a normal, basic tackle to me … . If it's a penalty, it's a penalty, but I didn't try to do it on purpose, obviously … . I didn't try to use my head; obviously, my head is connected to my shoulders."